These highlights do not include all the information needed to use GELNIQUE safely and effectively. See full prescribing information for GELNIQUE. GELNIQUE is indicated for the treatment of overactive bladder with symptoms of urge urinary incontinence, urgency, and frequency [see Clinical Studies 14]. The contents of one sachet of GELNIQUE should be applied once daily to dry, intact skin on the abdomen, upper arms/shoulders, or thighs. Application sites should be rotated. Application of GELNIQUE should not be made to the same site on consecutive days [see Clinical Pharmacology (12.3)]. GELNIQUE is for topical application only and should not be ingested. Each sachet contains a 1 gram unit dose (1.14 mL) of 100 mg/g oxybutynin chloride gel. Known hypersensitivity to GELNIQUE, including skin hypersensitivity [see Warnings and Precautions (5.3)]. Administer GELNIQUE with caution in patients with clinically significant bladder outflow obstruction because of the risk of urinary retention. Administer GELNIQUE with caution to patients with gastrointestinal obstructive disorders because of the risk of gastric retention. GELNIQUE, like other anticholinergic drugs, may decrease gastrointestinal motility and should be used with caution in patients with conditions such as ulcerative colitis or intestinal atony. GELNIQUE should be used with caution in patients who have gastroesophageal reflux and/or who are concurrently taking drugs (such as bisphosphonates) that can cause or exacerbate esophagitis. In a controlled clinical trial of skin sensitization, 1 of 200 patients (0.5%) demonstrated skin hypersensitivity to GELNIQUE. Patients who develop skin hypersensitivity to GELNIQUE should discontinue drug treatment. Transfer of oxybutynin to another person can occur when vigorous skin-to-skin contact is made with the application site. To minimize the potential transfer of oxybutynin from GELNIQUE-treated skin to another person, patients should cover the application site with clothing after the gel has dried if direct skin-to-skin contact at the application site is anticipated [see Clinical Pharmacology (12.3)]. Patients should wash their hands immediately after application of GELNIQUE. GELNIQUE is an alcohol-based gel and is therefore flammable. Avoid open fire or smoking until gel has dried. Administer GELNIQUE with caution in patients with myasthenia gravis, a disease characterized by decreased cholinergic activity at the neuromuscular junction. The safety of GELNIQUE was evaluated in 789 patients (389 randomized to GELNIQUE 1 g and 400 randomized to placebo) during a randomized, placebo-controlled, double-blind, 12-week clinical efficacy and safety study. A subset of these 789 patients (N=216) participated in the 14-week open-label safety extension that followed the placebo-controlled study. Of 216 patients in the safety extension, 107 were randomized to placebo gel during the double-blind, placebo-controlled 12-week study. In the combined double-blind, placebo-controlled study and the open-label safety extension, a total of 496 patients were exposed to at least one dose of GELNIQUE. Four hundred thirty-one (431) patients received at least 12 weeks of GELNIQUE treatment and 85 patients received 26 weeks of GELNIQUE treatment. The study population primarily consisted of Caucasian women (approximately 90%) with an average age of 59 years who had overactive bladder with urge urinary incontinence. Table 1 lists adverse events, regardless of causality, that were reported in the randomized, double-blind, placebo-controlled 12-week study at an incidence greater than placebo and in greater than 2% of patients treated with GELNIQUE. The most common adverse reactions, defined as adverse events judged by the investigator to be reasonably associated with the use of study drug, that were reported in â‰¥ 1% of GELNIQUE-treated patients were dry mouth (6.9%), application site reactions (5.4%), dizziness (1.5%), headache (1.5%), constipation (1.3%), and pruritus (1.3%). Application site pruritus (2.1%) and application site dermatitis (1.8%) were the most commonly reported application site reactions. A majority of treatment-related adverse events were described as mild or moderate in intensity, except for two patients reporting severe headache. No serious adverse events were judged by the investigator to be treatment-related during the randomized, double-blind, placebo-controlled 12-week study. The most common adverse reaction leading to drug discontinuation was application site reaction (0.8% with GELNIQUE versus 0.3% with placebo). The most common adverse reactions reported during the 14-week open-label extension study were application site reactions (6.0%) and dry mouth (1.9%). The most common reason for premature discontinuation was application site reactions (9 patients or 4.2%). Two of these 9 patients experienced application site reactions of severe intensity (dermatitis, urticaria, and erythema). The concomitant use of GELNIQUE with other anticholinergic (antimuscarinic) agents may increase the frequency and/or severity of dry mouth, constipation, blurred vision, somnolence and other anticholinergic pharmacological effects. There are no adequate and well-controlled studies of topical or oral oxybutynin use in pregnant women. Subcutaneous administration to rats at doses up to 25 mg/kg (approximately 50 times the human exposure based on surface area) and to rabbits at doses up to 0.4 mg/kg (approximately 1 times the human exposure) revealed no evidence of harm to the fetus due to oxybutynin chloride. The safety of GELNIQUE administration to women who are or who may become pregnant has not been established. Therefore, GELNIQUE should not be given to pregnant women unless, in the judgment of the physician, the probable clinical benefits outweigh the possible hazards. It is not known whether oxybutynin is excreted in human milk. Because many drugs are excreted in human milk, caution should be exercised when GELNIQUE is administered to a nursing woman. Safety and effectiveness of GELNIQUE in pediatric patients have not been established. Of the 496 patients exposed to GELNIQUE in the randomized, double-blind, placebo-controlled 12-week study and the 14-week safety extension study, 188 patients (38%) were 65 years of age and older. No overall differences in safety or effectiveness were observed between these patients and younger patients. There is no experience with the use of GELNIQUE in patients with renal impairment. There is no experience with the use of GELNIQUE in patients with hepatic impairment. Overdosage with oxybutynin has been associated with anticholinergic effects including central nervous system excitation, flushing, fever, dehydration, cardiac arrhythmia, vomiting, and urinary retention. Oral ingestion of 100 mg oxybutynin chloride in association with alcohol has been reported in a 13-year-old boy who experienced memory loss, and in a 34-year-old woman who developed stupor, followed by disorientation and agitation on awakening, dilated pupils, dry skin, cardiac arrhythmia, and retention of urine. Both patients recovered fully with symptomatic treatment. Plasma concentrations of oxybutynin begin to decline 24 hours after GELNIQUE application. If overexposure occurs, monitor patients until symptoms resolve. Oxybutynin is an antispasmodic, antimuscarinic agent. GELNIQUE (oxybutynin chloride) is a clear and colorless hydroalcoholic gel containing 100 mg oxybutynin chloride per gram of gel. GELNIQUE is available in a 1 gram (1.14 mL) unit dose that contains 100 mg oxybutynin chloride. Oxybutynin is delivered as a racemate of R- and S- isomers. Chemically, oxybutynin chloride is d, l (racemic) 4-(Diethylamino)-2-butynyl (±)-Î±-phenylcyclohexaneglycolate hydrochloride. Oxybutynin chloride is a white powder with a molecular weight of 393.95. Inactive ingredients in GELNIQUE are alcohol, USP; glycerin, USP; hydroxypropyl cellulose, NF; sodium hydroxide, NF; and purified water, USP. Oxybutynin acts as a competitive antagonist of acetylcholine at postganglionic muscarinic receptors, resulting in relaxation of bladder smooth muscle. In patients with conditions characterized by involuntary detrusor contractions, cystometric studies have demonstrated that oxybutynin increases maximum urinary bladder capacity and increases the volume to first detrusor contraction. Oxybutynin is a racemic (50:50) mixture of R- and S- isomers. Antimuscarinic activity resides predominantly with the R-isomer. The active metabolite, N-desethyloxybutynin, has pharmacological activity on the human detrusor muscle that is similar to that of oxybutynin in in vitro studies. Oxybutynin is transported across intact skin and into the systemic circulation by passive diffusion across the stratum corneum. Steady-state concentrations are achieved within 7 days of continuous dosing. Absorption of oxybutynin is similar when GELNIQUE is applied to the abdomen, upper arm/shoulders or thighs. Mean plasma concentrations during a randomized, crossover study of the three recommended application sites in 39 healthy men and women are shown in Figure 1. 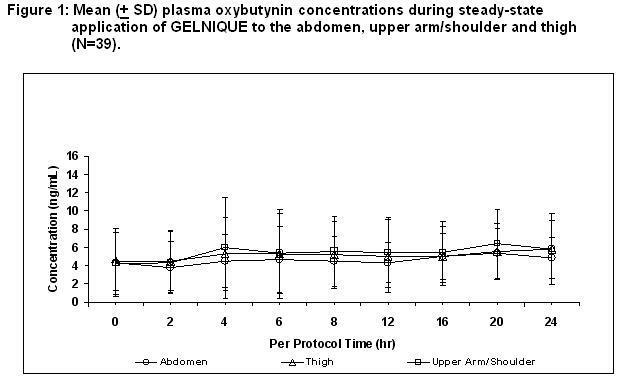 Average steady-state plasma oxybutynin concentrations were 4.7, 5.2, and 5.5 ng/mL for the abdomen, upper arm/shoulder and thigh application sites, respectively (Table 2). Table 2: Mean (SD) steady-state pharmacokinetic parameters for oxybutynin following GELNIQUE application to the abdomen, upper arm/shoulder and thigh (N=39). Oxybutynin is metabolized primarily by the cytochrome P450 enzyme systems, particularly CYP3A4, found mostly in the liver and gut wall. Metabolites include phenylcyclohexylglycolic acid, which is pharmacologically inactive, and N-desethyloxybutynin (DEO), which is pharmacologically active. Transdermal administration of oxybutynin bypasses the first-pass gastrointestinal and hepatic metabolism, reducing the formation of the N-desethyloxybutynin metabolite. Only small amounts of CYP3A4 are found in skin, limiting pre-systemic metabolism during transdermal absorption. The AUC ratio of N-desethyloxybutynin metabolite to parent compound following multiple transdermal applications is approximately 1:1 for GELNIQUE. Following intravenous administration, the elimination half-life of oxybutynin is approximately 2 hours. After the final steady-state dose of GELNIQUE, oxybutynin and N-desethyloxybutynin demonstrated biphasic elimination with plasma concentrations beginning to decrease 24 hours after dosing. Elimination was more rapid between 24 and 48 hours after dosing, during which time plasma concentrations of oxybutynin and N-desethyloxybutynin declined by about one-half. This rapid elimination phase was followed by a more prolonged terminal elimination phase. The apparent elimination half-lives including the terminal elimination phase were 64 hours and 82 hours for oxybutynin and DEO, respectively. Oxybutynin is extensively metabolized by the liver, with less than 0.1% of the administered dose excreted unchanged in the urine. Less than 0.1% of the administered dose is excreted as the metabolite N-desethyloxybutynin. The potential for dermal transfer of oxybutynin from a treated person to an untreated person was evaluated in a single-dose study where subjects dosed with GELNIQUE engaged in vigorous contact with an untreated partner for 15 minutes, either with (N=14 couples) or without (N=12 couples) clothing covering the application area. The untreated partners not protected by clothing demonstrated detectable plasma concentrations of oxybutynin (mean Cmax = 0.94 ng/mL). Two of the 14 untreated subjects participating in the clothing-to-skin contact regimen had measurable oxybutynin plasma concentrations (Cmax â‰¤ 0.1 ng/mL) during the 48 hours following contact with treated subjects; oxybutynin was not detectable with the remaining 12 untreated subjects. The effect of sunscreen on the absorption of oxybutynin when applied 30 minutes before or 30 minutes after GELNIQUE application was evaluated in a single-dose randomized crossover study (N=16). Concomitant application of sunscreen, either before or after GELNIQUE application, had no effect on the systemic exposure of oxybutynin. The effect of showering on the absorption of oxybutynin was evaluated in a randomized, steady-state crossover study under conditions of no shower, or showering 1, 2 or 6 hours after GELNIQUE application (N=20). The results of the study indicate that showering after one hour does not affect the overall systemic exposure to oxybutynin. The effect of race on the pharmacokinetics of GELNIQUE has not been studied. Available data suggest that there are no significant differences in the pharmacokinetics of oxybutynin based on geriatric status in patients following administration of GELNIQUE [see Use in Specific Populations (8.5)]. The pharmacokinetics of oxybutynin and N-desethyloxybutynin have not been evaluated in individuals younger than 18 years of age [see Use in Specific Populations (8.4)]. Available data suggest that there are no significant differences in the pharmacokinetics of oxybutynin based on gender in healthy volunteers following administration of GELNIQUE. There is no experience with the use of GELNIQUE in patients with renal insufficiency. There is no experience with the use of GELNIQUE in patients with hepatic insufficiency. A 24-month study in rats at dosages of oxybutynin chloride of 20, 80 and 160 mg/kg showed no evidence of carcinogenicity. These doses are approximately 6, 25 and 50 times the maximum exposure in humans taking an oral dose, based on body surface area. Oxybutynin chloride showed no increase of mutagenic activity when tested in Schizosaccharomyces pompholiciformis, Saccharomyces cerevisiae, and Salmonella typhimurium test systems. Reproduction studies with oxybutynin chloride in the mouse, rat, hamster, and rabbit showed no definite evidence of impaired fertility. The efficacy and safety of GELNIQUE were evaluated in a single randomized, double-blind, placebo-controlled, parallel group 12-week study for the treatment of overactive bladder with symptoms of urge incontinence, urgency and frequency. Key entry criteria included adults with symptomatic overactive bladder with an average of â‰¥ 4 incontinence episodes in a 3-day period and at least 8 micturitions per day. Patients were randomized to daily applications of GELNIQUE 1 gram or matching placebo gel. A total of 389 patients received GELNIQUE and 400 patients received placebo gel. The majority of patients were Caucasian (86.3%) and female (89.2%), with a mean age of 59.4 years (range: 18 to 88 years). The average duration of urinary incontinence was approximately 8.5 years and approximately 75% of patients had no prior pharmacological treatment for urinary incontinence. Patients treated with GELNIQUE experienced a statistically significant decrease in the number of urinary incontinence episodes per day from baseline to endpoint (the primary efficacy endpoint) compared with placebo (p<0.0001) as well as a decrease in the average daily urinary frequency (p=0.0017) and an increase in the average urine volume per void (p=0.0018). Mean and median change from baseline in daily incontinence episodes (primary endpoint), urinary frequency, and urinary void volume (secondary endpoints) between placebo and GELNIQUE are summarized in Table 3. Table 3: Mean and median change from baseline for incontinence episodes, urinary frequency, and urinary void volume at Week 12 (LOCF*). Unit Dose: Heat-sealed sachet containing 1 gram (1.14 mL) of GELNIQUE gel for topical use. Store at 25°C (77°F); excursions permitted to 15-30°C (59-86°F). See USP controlled room temperature. Protect from moisture and humidity. Apply immediately after the sachets are opened and contents expelled. Discard used sachets in household trash in a manner that prevents accidental application or ingestion by children, pets, or others. GELNIQUE should not be applied to recently shaved skin surfaces. Patients should wash hands immediately after product application. Application sites should not be subject to showering or water immersion for 1 hour after product application. 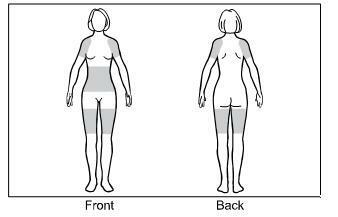 Application sites should be covered with clothing if close skin-to-skin contact at the application site is anticipated. Patients should be informed that anticholinergic (antimuscarinic) agents, such as GELNIQUE, may produce clinically significant adverse reactions related to anticholinergic pharmacological activity including constipation, urinary retention and blurred vision. Heat prostration (due to decreased sweating) can occur when anticholinergics such as GELNIQUE are used in a hot environment. Because anticholinergic (antimuscarinic) agents, such as GELNIQUE, may produce dizziness or blurred vision, patients should be advised to exercise caution in decisions to engage in potentially dangerous activities until GELNIQUEâ€™s effects have been determined. Patients should be informed that alcohol may enhance the drowsiness caused by anticholinergic (antimuscarinic) agents such as GELNIQUE. Read this information carefully before you begin treatment. Read the information whenever you refill a prescription as there may be something new. This information does not take the place of talking with your doctor about your medical condition or your treatment. If you have any questions about GELNIQUE, ask your doctor. Only your doctor can determine if GELNIQUE is right for you. GELNIQUE is a clear and colorless topical gel approved for the treatment of overactive bladder with symptoms of urge urinary incontinence, urgency, and frequency. It delivers the active ingredient, oxybutynin, directly into your bloodstream through your skin. Overactive bladder makes it hard to control urination (passing water). Overactive bladder can make you urinate more often (increased frequency) or make you feel the need to urinate suddenly (urgency). Overactive bladder can also lead to accidental urine loss (leaking or wetting oneself). The active ingredient in GELNIQUE, oxybutynin, is formulated into a topical gel for daily application. GELNIQUE delivers the medicine slowly and constantly through your skin and into your bloodstream for 24 hours. GELNIQUE contains the same active ingredient as oxybutynin tablets, patches and syrup. Who should not use GELNIQUE? Urinary retention. Your bladder does not empty or does not empty completely when you urinate. Gastric retention. Your stomach empties slowly or incompletely after a meal. Uncontrolled narrow-angle glaucoma (high pressure in your eye). Tell your doctor if you have glaucoma or a family history of glaucoma. Allergy to oxybutynin or the inactive ingredients in GELNIQUE. If you need to know the inactive ingredients, ask your doctor or pharmacist. If you have allergies to topical medical products, tell your doctor. Tell your doctor about all the medicines you take, including prescription and non-prescription medicines and supplements. Some of them may cause problems if you administer GELNIQUE. Also, GELNIQUE may affect how some medicines are absorbed from the stomach. What should I avoid while using GELNIQUE? Do not apply GELNIQUE to areas of the skin that have been treated with oils, lotions, or powders as that could affect the amount of oxybutynin absorbed through the skin. However, GELNIQUE may be used with sunscreen. 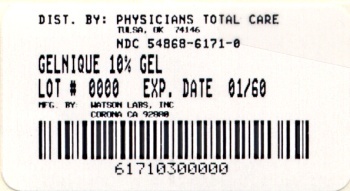 GELNIQUE is a gel which contains alcohol. Gels with alcohol are flammable. Avoid fire, flame or smoking until the gel has dried. What are the possible side effects of GELNIQUE? You may have skin changes at the site of application, such as itching, rash, or redness. If uncomfortable irritation or excessive itchiness continues, tell your doctor. Oxybutynin may cause sleepiness or blurred vision, so be careful when driving or operating machinery. Drinking alcoholic beverages may increase these effects. Since oxybutynin treatment may decrease sweating, you may overheat or have fever or heat stroke if you are in warm or hot temperatures. The most common side effect of GELNIQUE is dry mouth. Other possible side effects include application site skin changes (such as itching, rash, or redness), headache, constipation, and dizziness. If you take other medicines that cause dry mouth, constipation, or sleepiness, GELNIQUE can increase those effects. Tell your doctor if you have any side effect that bothers you or that does not go away. These are not all the possible side effects of GELNIQUE. For more information, ask your doctor or pharmacist. How should I use GELNIQUE? GELNIQUE is for application to the skin only. GELNIQUE SHOULD NOT BE TAKEN BY MOUTH. Important: Avoid contact with eyes, nose, open sores, recently shaved skin, and skin with rashes or other areas not approved for the application of GELNIQUE. Step 1. The approved application sites for GELNIQUE are the shaded areas shown in Figure A. These are the abdomen (stomach area), upper arms/shoulder, and thigh. Select an approved site for the application of GELNIQUE. Changing the approved application sites with each dose is recommended and may help you to find the most comfortable areas for applying GELNIQUE. The approved application sites are shown below. Do not apply GELNIQUE in an area that is not approved. Step 2. Wash your hands with soap and water before applying GELNIQUE. Step 3. Wash the area where GELNIQUE will be applied with mild soap and water. Step 4. Tear the packet of GELNIQUE open at the indentation just before use. See Figure B. Squeeze the entire contents of the packet into the palm of your hand or squeeze directly onto the application site. 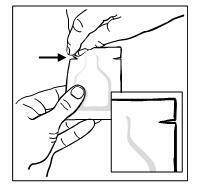 See Figure C.
Squeeze from the bottom of the packet toward the open end. Repeat until the packet is empty. The amount of gel in each packet will be about the size of a nickel on your skin. Step 5. Gently rub GELNIQUE into your skin until it dries. Do not continue rubbing after GELNIQUE has dried. If applying GELNIQUE to the stomach, care should be taken to avoid the area around the navel (belly-button). See Figure D.
Step 6. Carefully throw away the open packet of GELNIQUE so that children and pets are not exposed to it. Step 7. After applying GELNIQUE, immediately wash your hands thoroughly with soap and water. Avoid bathing, swimming, showering, exercising or immersing the application site in water for one hour after application. The application site may be covered with clothing once GELNIQUE has dried. What should I do if someone else is exposed to GELNIQUE? If someone else is exposed to GELNIQUE by direct contact with the gel or at the application site of GELNIQUE, that person should wash the area of contact with soap and water as soon as possible. What should I do if I get GELNIQUE in my eyes? If you get GELNIQUE in your eyes, rinse your eyes right away with warm, clean water to flush out any GELNIQUE. Seek medical attention if needed. Medicines are sometimes prescribed for conditions that are not mentioned in patient information leaflets. Do not give GELNIQUE to other people, even if they have the same symptoms you have. It may harm them. This leaflet summarizes the most important information about GELNIQUE. If you would like more information, talk with your doctor. You can ask your pharmacist or doctor for information about GELNIQUE that is written for health professionals. You can get more information about GELNIQUE from the product information department at 1-800-272-5525 or by selecting patient information at the GELNIQUE Website located at www.GELNIQUE.com. Store at room temperature, 25°C (77°F). Temporary storage between 15 - 30°C (59 - 86°F) is also permitted. Keep GELNIQUE and all medications in a safe, secure place and out of the reach of children.